Memorial Day marks the beginning of the summer baseball season in many parts of the country, Florida included. The FHSAA State Finals wrapped up just prior to the start of the holiday weekend, meaning players had to make the switch from metal to wood. With the new BBCOR bats in play during the high school season, the adjustment to wood bats for summer baseball isn’t as dramatic as it used to be – but it’s still most certainly an adjustment. For most players, it’s a rough start to summer – as we’ve seen here this weekend. This offers a prime opportunity, however, for the more advanced hitters to shine – which we’ve also seen here this weekend. Jacksonville Warriors 17 White has a pair of physical hitters who’ve shown no trouble handling the wood bats early. University of Florida commit, and 2016 graduate, Keenan Bell (Stanton Prep) stands at 6-foot-3 and 215 pounds. He barreled the ball up regularly, and showed the ability to drive it through both gaps. 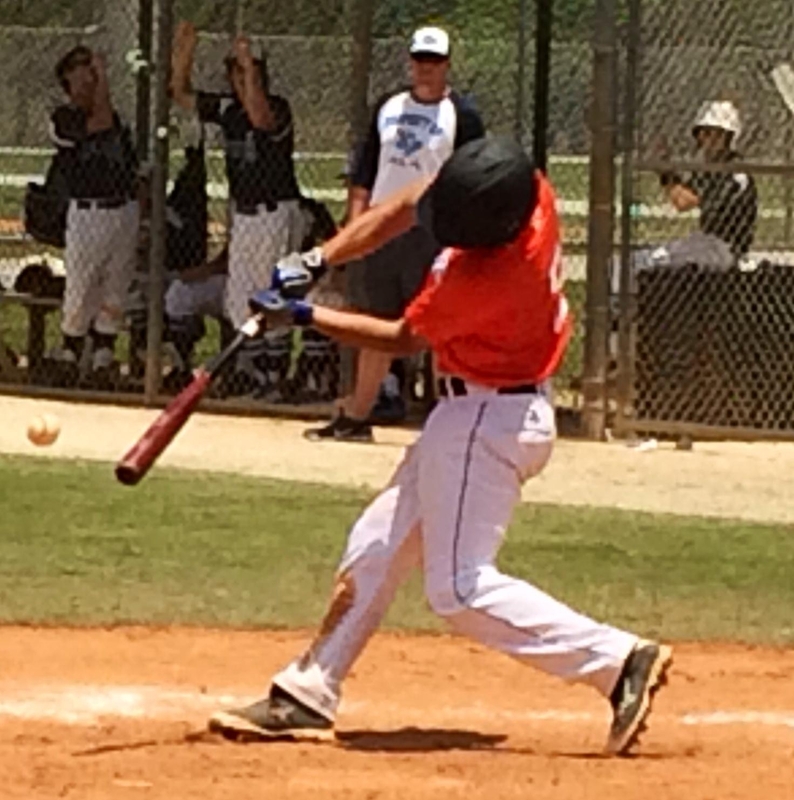 His teammate Kyle Jenkins, a 1B/C from Mandarin HS, featured a short stroke with strength through contact. Fellow 2016 graduate, and Warriors organization player, Bryce Newman packs a lot of punch in his left handed stroke. At 5-foot-8 and 145 pounds he isn’t physically imposing, but he’s hit the ball hard all over the ballpark with wood. Palm Beach PAL 15 OF Aldrich de Jong is comparable to Newman, he’s also a 2016 left handed hitter that generates surprising power for his size. 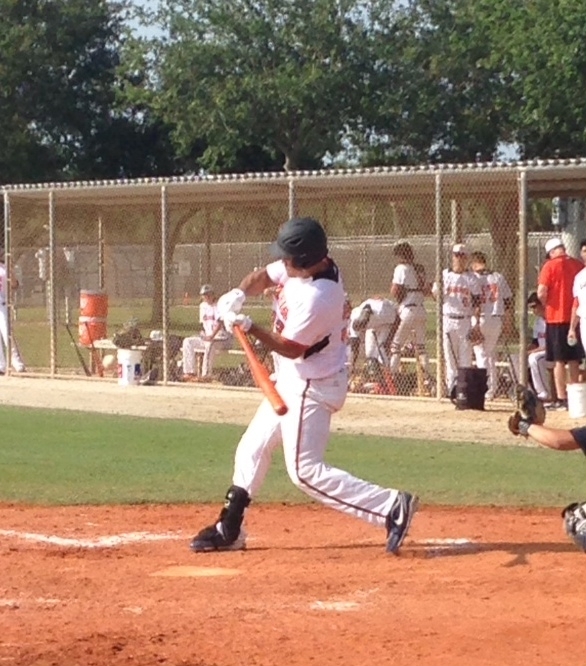 Though he is also a 2016 grad, A’s Baseball 18 Select OF Hernan Sardinas stands at 6-foot-2 and 195 pounds. He’s aggressive early in the count, and features a smooth left handed swing with extra base power. A pair of infielders stood out in terms of strike zone knowledge and plate discipline, among other things. Easton Rockets 18 junior infielder Tyler Frank (American Heritage HS) has a mature patient approach, along with a coordinated stroke and an excellent glove at third base. Though he’s a couple of years younger than Frank, Florida Legends 2017 Freddy Zamora stood out for many of the same reasons. He’s patient enough to look for a good pitch to hit, and has the ability to drive it with authority when he gets it. He’s a special young player, with a combination of natural talent and an advanced feel for the game. Though you wouldn’t know it from looking at him, Easton Rockets 16 two-way guy Kristopher Armstrong hasn’t started high school yet. Only a 2018 graduate, he stands at 6-foot-3 and 185 pounds with great baseball bloodlines – his father Jack reached the major leagues just one year after he was the Reds first round pick, and went on to pitch for parts of six more seasons in the big leagues. Kristopher appears to have an advanced feel for hitting a young age from both sides of the plate, and is already physical enough to drive the ball past the outfielders with a wood bat at his young age. This entry was posted in 2014 Under Armour Memorial Day Classic, 2014 Under Armour Tournaments and tagged A's Baseball 18 Select (FL), Aldrich de Jong, Bryce Newman, Easton Rockets 16 (FL), Easton Rockets 18 (FL), Florida Legends 2017, Freddy Zamora, Hernen Sardinas, Jacksonville Warriors 16 Black, Jacksonville Warriors 17 White, Keenan Bell, Kristopher Armstrong, Kyle Jenkins, Palm Beach PAL 15, Tyler Frank on May 25, 2014 by Andy Ferguson.